We’ve been raising money since December 2005 and while we have had a lot of fun doing it traveling to far flung places and trying new things (overnight bike rides on a tandem anyone?) we’ve managed to raise money to buy Sam crucial life changing equipment. So far, with everyone’s support, we have been able to get Sam a customised wheelchair, arm supports and an exercise bike – Sam clearly doesn’t want to be left out of the fun. By simply bringing in old unwanted books to work and selling them off for 50p a shot we’ve managed to raise over £3000 (and counting). At 50p you really can afford to judge a book by it’s cover and sneak the odd guilty pleasure in the form of Jilly Cooper (ok, so you may spend more on the wrapping paper to disguise the cover on the tube but hey). This has been a surprise success story and really is money for nothing. We’ve had quite a few! There have been unwanted Christmas present sales, scarf and cake sales in Peterborough and Christmas craft fairs in London. People have made amazing things and others have come in their droves to buy! We’re amazed by the support everyone has shown. The first unwanted Christmas presents sale in January 2006 raised a whopping £1,310! 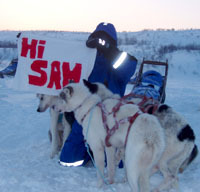 Donations of money, time and raffle prizes have been a constant of the stuff4sam efforts. We’d like to thank everyone who has supported s4s in this way. Four intrepid men took to the Thames in their sturdy(ish) boat and rowed from Lechlade to Putney raising a substantial amount of money for stuff4sam. Big respect to the boys for the huge logistical and physical effort involved. More info about the row 4 sam. Gruelling training through the winter prepared Fran and Ruth for their 10k run in the biting winds of the south coast in May o7. With the support of their friends, families and colleagues, they raised £450. Over £2000 was raised in spectacular style at the stuff4sam party. Over 60 people joined us for a night of entertainment, dancing and prizes. The £5 raffle draw and exciting auction with fabulous lots were the highlight of the evening with people going home with exciting items donated by our friends, family and contacts. On Sunday 3 September 2006 Debbie and Jane did the Hydro Women’s 5k in Hyde Park. It was a long hot day but battling against the heat they managed to bring home a princely sum of £400 before hitting the pub for some refreshments. 18-month old Arlo kindly raised money from his pals by doing a one-mile sponsored walk! He got distracted on the way round and kept picking up gravel but on the whole, the event was a success. Big thanks to our youngest supporter and his parents! 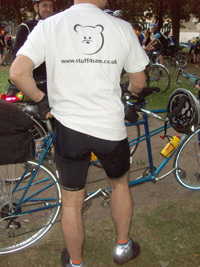 Our intrepid adventurer Hugh (rowing gold medalist at the 2004 World Championships no less) and his pal James did the 2006 Dunwich Dynamo overnight bike ride on a tandem. On the scale of thing you may think that £80 is not that much but we couldn’t have hand picked our colleagues better. We were only collecting for three weeks. Hmm, need to get more creative with our vocabularies! no se inglews pero de todas maneras besos y abrazos a su familia no sabes la tristeza que me dio desde mi pais chile en america del sur al daber esta noticia yo tengo 4 hijos y se lo que duele cualquier cosa que les pase. FELIZ PERO TRISTE, PIENSO QUE ES LA MEJOR Y PEOR DESICION QUE PUDIERON TOMAR COMO PAPAS, SI DIOS LOS JUNTO PARA QUE FUERAN UNA FAMILIA EL MISMO JUNTO A TODOS EN EL CIELO LES DARAN LA BIENVENIDA POR SER UNOS PADRES TAN VALIENTE, JUNTOS LLEGARON JUNTOS SE VAN, YO SOY MAMA Y SIENTO LO MISMO QUE ELLOS SIN MI NIÑO NUNCA MAS LA VIDA JAMAS VOLVERIA HA SER LA MISMA Y ELLOS LO SABIAN, LUCHARON POR MEJORAR SU CONDICIÓN LO MAS QUE PUEDIERON SE PREPARARON Y VOLARON JUNTOS. ESPERO QUE CUANDO NOS LLEGUE LA HORA A TODOS ESTEN ESPERANDONOS PARA RECIBIRNOS.